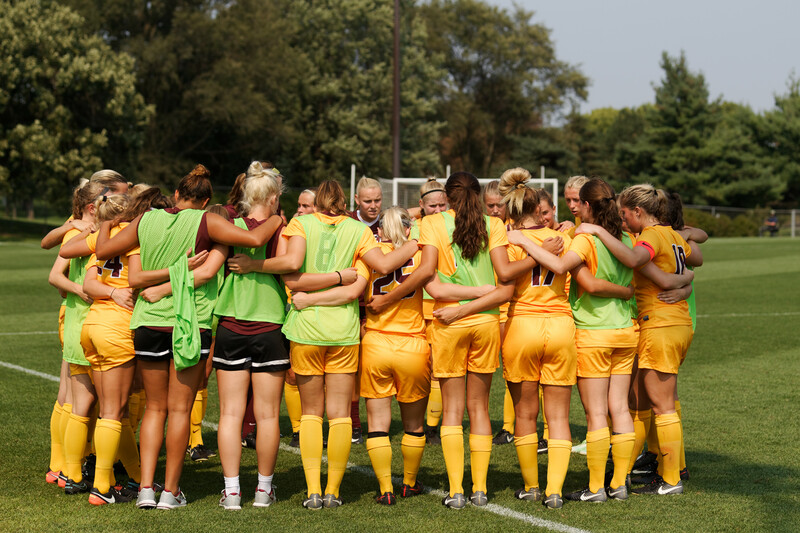 When they officially commit to the University of Minnesota in February, the Gophers’ soccer class of 2022 will be wrapping up what can be a decade-long process of choosing their college program. Even though the new class of recruits comes in as the young guns on the squad, they’re far from inexperienced. The journey to Division I college soccer is a long one, with crucial decisions starting all the way back in elementary school. 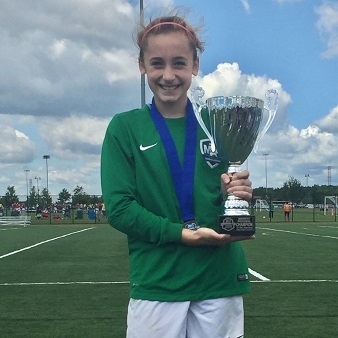 Bayliss Flynn is 12 years old, but she’s already been on her path to college soccer for years. Her dreams of suiting up for a prestigious Ivy League school may seem premature for your average seventh grader, but Bayliss is anything but average. Since trying out for the Minnesota Thunder Academy at nine years old, she’s been surrounded by some of the best soccer players in the state. These girls come to MTA for one reason and one reason only: they want to play college soccer. Mary Lahammer, Bayliss’s mom, says that shared and singular focus helps remove the standard drama that can come from other youth sports. “They want to train at the highest level and they want to play at the highest level,” Lahammer said. In other words: there’s no messing around. When these seventh and eighth graders are opening presents on Christmas morning, they’re not getting toys and gift cards. They’re getting sweatshirts and swag from all the colleges on their wish list. These girls train together almost every day. They travel across the country together — without their parents — to play the best competition the U.S. has to offer. For Bayliss, the starting goalkeeper on MTA’s U-14 squad, the pressure is worth it. “Making the save, you get this rush of adrenaline that’s just super fun. I love it,” Bayliss explained. If you’re like me, the idea of making a life-altering decision at nine seems almost insane. But when you actually sit down and talk to Bayliss, you get the idea that almost nothing could shake her. Her mother describes her as an old soul who’s always been advanced for her age. A girl who walked at six months and talked at nine. A girl who greeted her pediatrician with a formal greeting at a year old. By now, after years of training and playing with some of the best players in the state, it’s clear that the decision to try out for MTA at nine years old set Bayliss on a different path than your standard club player. Her mom, Mary Lahammer, was a standout basketball and track star. Her dad, Chad Flynn, was a tennis star who grew up as a standout youth soccer player in Coventry, England and put a ball in Bayliss’s crib almost from birth. To avoid the burnout and heightened risk for injury that can come from specializing in one sport too early, her parents have encouraged Bayliss to stay involved in basketball, cross country, and track and field as long as possible—even admitting that playing basketball for the Lakeville North school team may mean bringing a second goalkeeper in to her MTA squad for when she has to miss training and games. Bayliss doesn’t have to look far for her multisport inspiration. 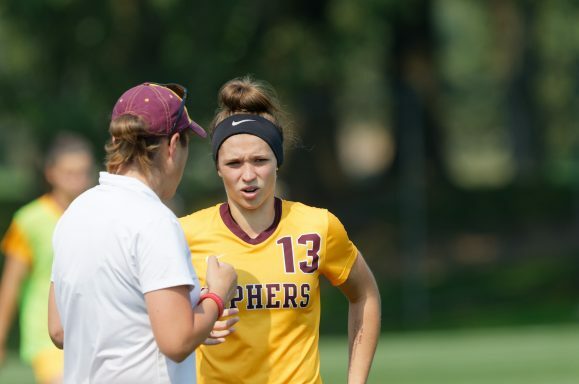 Fellow Lakeville North multisport standout Simone Kolander only recently graduated from the University of Minnesota and played last season in the Champions League in Europe. 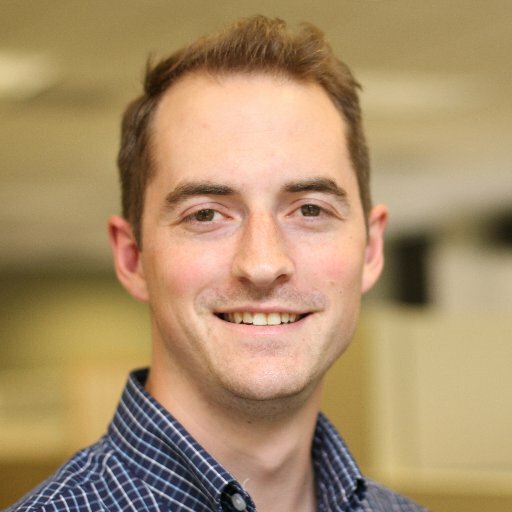 Until recently, the decision Bayliss made to play high-level club soccer also came with a second, implied expectation: that teenagers may skip playing school sports all together. Because high school sports — even at top high-school programs — can be more physical and less technically sound, there’s been growing pressure for top recruits to side step the risks of high school league play, and simply invest their time in the club circuit. The tension between Elite Club National League (ECNL) clubs and associations like the Minnesota State High School League (MSHSL) had high school coaches worried they would lose their top players to the more competitive club leagues. Both sides in Minnesota realized an all out war over players was unsustainable, and recently instituted a truce of sorts. ECNL clubs (just MTA for soccer) will now put a pause on their calendars for high school age players during the fall soccer season, so families are no longer forced to choose between wearing their school colors proudly and facing the absolute top competition week in and week out. But for the incoming recruiting class for the Gopher soccer program, the risk to the high school programs isn’t just the club teams, it’s the colleges. In some states, high school soccer is played in the spring (not the fall, like it’s played in Minnesota). So when Patricia Ward, a highly-touted recruit in the 2018 class decided to finish high school a semester early, and enroll at the University of Minnesota in January to prepare for next season, she had to forfeit her senior season. Ward will be in good company in Minnesota. Four of the six incoming freshman are enrolling early. But that choice has been anything but a trend to this point. During head coach Stefanie Golan’s tenure, no early enrollee has finished their career with the Gophers. Part of the issue in the past has been a feeling of isolation that can come from entering college after the current freshman class but before the next — especially if a new player has to go through that experience as the only early enrollee. Coaches are confident this cohort of four will have an easier go of it. Going from Bayliss’s position to Patricia’s usually goes something like this. During a player’s ninth grade year, players are coached to first establish a broader universe of twenty-five or so colleges they may consider. But actually talking to those programs is another story. Current Gopher soccer captain Emily Heslin can still remember jumping through hoops. By their tenth grade year, players need to narrow that list down to a handful of schools they’d be comfortable committing to, as that’s when offers traditionally start rolling in. A few years ago, committing a full two years before graduation was still considered late. Returning Gopher standout April Bockin used that to her advantage during her recruitment. Now, just a few years later, when new recruits visit Heslin and Bockin on campus, they might be just high school freshman, verbally committing a full year before either of the aforementioned current Gophers did. Few understand the nuances between clubs, high schools, and colleges more than Bulut “Turk” Ozturk. Turk is in his mid thirties and looks even younger, but his experience is vast. 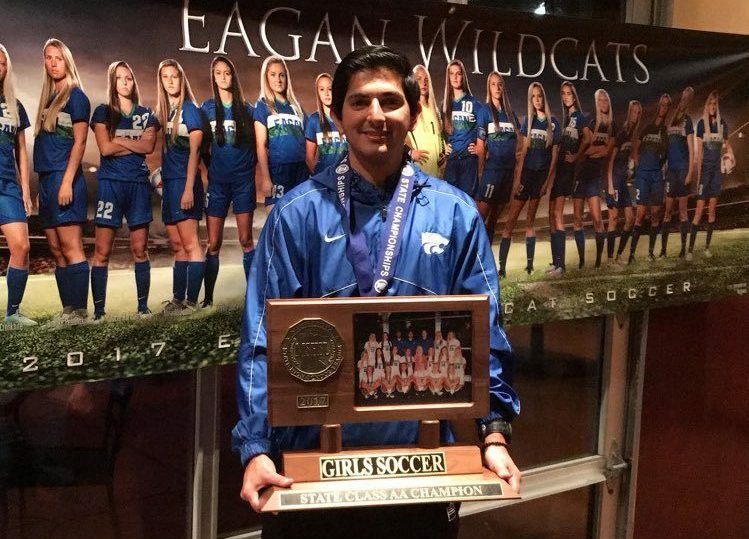 He got his start coaching his sister’s soccer teams, and worked his way up to the coaching staffs at Division-III Hamline University, and Division-II Concordia University in St. Paul. As a head coach, Turk won titles in women’s soccer with the MTA U-14s, the Eagan High School varsity team, and the TwinStars semi-pro team. He also previously coached the Dakota Rev and Lakeville North. In an era when youth sports seem to breed tension and drama, Turk is incredibly composed. When asked how he deals with the competing needs of the team, individual players, their parents, interested college coaches, and the general insanity that comes from coaching three teams virtually year-round, Turk is unfazed. In fact, the day I spoke to him was his day off, which he was spending —I kid you not—at a soccer tournament. Turks credits both luck and good communication for helping him avoid the tension other programs sometimes see at the youth level. Though he admits that the entire development and recruiting process is starting earlier and earlier. When parents on the U-14 team ask if they can start ramping up recruiting outreach, he generally advises slowing things down. Still, as the coach of a ECNL team, Turk is in the thick of it. At their winter showcase event in Minnesota, they’ll draw 30 or more college coaches. 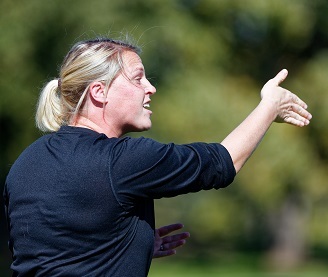 At national ECNL events, it might be more like 70 to 100 coaches. And because of restrictions on when those college coaches can talk to players, a lot of the communications flows through him for both his club and high school teams. And his track record speaks for itself. Many of those players end up at Midwestern Division I schools like North Dakota State or South Dakota State. Others may end up playing Division II in the Northern Sun Intercollegiate Conference. And some play Division III. The decision can sometimes come down to simple dollars and cents. 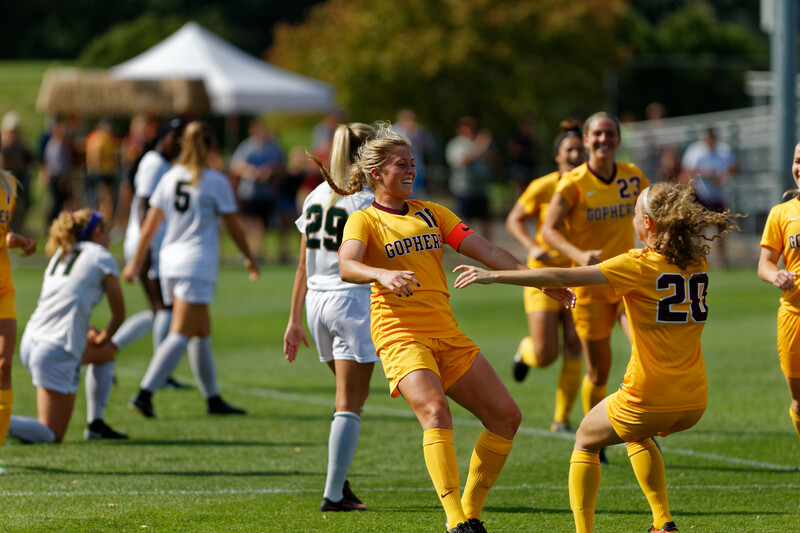 In Division I women’s soccer, each team is allowed to give out 14 full scholarships that cover the total cost of attendance including tuition, room and board, books, etc. (though not all programs will offer all 14). And because women’s soccer is an equivalency sport, the equivalent of those 14 scholarships can be divided among any number of players. Functionally, that means nearly all recruited players are getting most of their costs covered. For example, if 18 players on the Gophers team were splitting those scholarships equally—which they don’t—each player would be receiving the equivalent of a 77-percent scholarship. If a player ends up at a Division II school, which is allowed to give 9.9 scholarships, the gap could be a bit larger. But keep in mind, it’s still possible to make up that difference with an academic scholarship. For a player, all the cards are essentially on the table. They have different offers from different schools. And though their offers may change over time, it’s still largely transparent. For a college coach, it’s a bit like blackjack. Sure, you know what offers you’re making, but you have no idea what other offers a recruit may have on the table. At times, colleges limit their risk by extending specific offers only for a particular period of time. That way, they don’t have hundreds of thousands of dollars hanging in the balance for months at a time. Even then, when a recruit “commits” in those early years, it’s only a non-binding verbal commitment. Official signing day isn’t until the February preceding the following season. So, in the case of a player like Patricia Ward who starts a semester early, she’s moving across the country and starting her spring classes all before that official signing day. Needless to say, college coaches aren’t crazy about the way things work. Gophers associate head coach Krystle Seidel thinks the signing date in particular needs to be moved up. The Gophers staff, too, is worried that recruiting targets continue to get younger and younger. Though Seidel is quick to point out that there’s no magic bullet to slowing things down, her own career provides a great reference point. As a top prospect herself, who went on to have successful stops at both West Virginia and the University of Minnesota less than a decade ago, her experience was quite a bit different. After all the twists and turns, the endless hours on the road and the practice field, players do eventually make it to campus. Check back next month for a comprehensive look at Minnesota’s 2018 recruiting class, how they might fit with the team, and who could see major minutes from day one.